View More In Blue-Eyed Soul. Newly remastered sound and expanded packaging including lyrics of the Two CD set reissue of the 1994 album, recorded live A Night in San Francisco by Van Morrison. 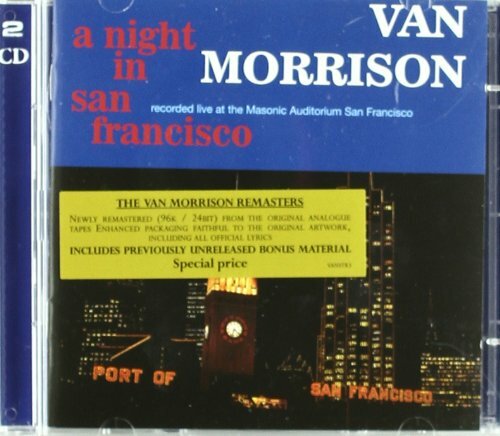 In contrast to these commercially-successful but not always critically acclaimed albums, the 1994 live double album, A Night in San Francisco was a "tour-de-force", clearly demonstrating Morrison's talents and his influences in equal measure and reached #8 on the UK charts. The Rolling Stone magazine review states the album stands as: "the culmination of a career's worth of soul-searching that finds Morrison's eyes turned toward heaven and his feet planted firmly on the ground."